Free Speech on Israel welcomes the statement from Unite defending the union’s South-East Regional Secretary Jennie Formby against antisemitism allegations. 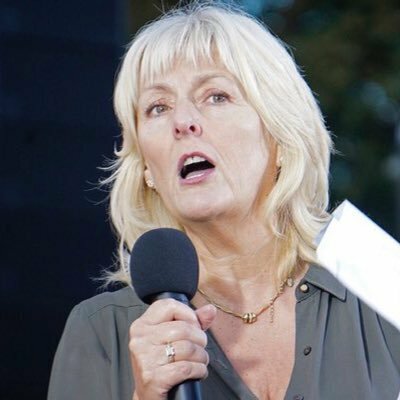 Accusations levelled against Jennie Formby by the group calling itself Labour Against Anti-Semitism are just the latest in its campaign of malicious and baseless charges targeting the Labour Left. LAAS was created and exists for the sole purpose of suppressing criticism of the state of Israel for its crimes against the people of Palestine. Its smearing tactics have nothing to do with combatting real antisemitism – hostility, prejudice or discrimination against Jews because they are Jews. They expose their malicious intent by citing a definition of antisemitism which has been discredited for conflating criticism of Israel with criticism of Jews, thereby endangering free speech for those campaigning for justice for Palestinians. In attacking Jennie Formby LAAS are vilifying a committed anti-racist campaigner. They are also deliberately trying to disrupt the important process of appointing a new general secretary of the Labour Party – a role Jennie Formby is eminently qualified to fill. Jewish Voice for Labour (JVL) is a new group that aims to reinvigorate the Jewish socialist tradition inside the Labour Party. FSOI has, from its establishment in 2016, been active in combatting the Labour Party’s acquiescence in the Zionist campaign to demonise criticism of Israel. The Party bureaucracy and many leading figures on the right of the Party have uncritically adopted the views of the so-called Jewish Labour Movement (JLM) that Israel, even under its extreme right-wing leadership, is a natural bedfellow of Labour. Opposition to Netanyahu’s regime is assumed to be antisemitic unless shown otherwise – and that judgement is to be made by sceptical, if not actively hostile, adjudicator. There can now be no doubt: Pro-Israel advocates in the UK have been working with representatives of the Israeli state to undermine their political opponents. News of covert meetings between an Israeli diplomat and Tory and Labour politicians is evidence of a concerted campaign to undermine pro-Palestinian currents in both parties. These latest revelations vindicate the case that Free Speech on Israel has been making for many months. There can now be no doubt: Pro-Israel advocates in the UK have been working with representatives of the Israeli state to undermine their political opponents. The Labour Party leadership of Jeremy Corbyn, a strong supporter of Palestinian rights, has been a particular target. Evidence exposed by Al-Jazeera shows that the Israeli government has ‘infiltrated’ both the Conservative and Labour parties via its embassy in the UK, using secret cash and covert support. Film footage shows intelligence expert Shai Masot joking with senior Labour MP Joan Ryan about having obtained ‘more than £1 million’ to pay for sympathetic Labour MPs to visit Israel. He was also filmed discussing with Maria Strizzolo, senior aide to Conservative Education Minister Robert Halfon, how to “take down” Foreign Office minister Sir Alan Duncan, a supporter of a Palestinian state. Halfon and Ryan are leading members of their parties’ respective ‘Friends of Israel’ lobby groups. This is a blatant attempt to close down the affair. But a scandal of this magnitude needs to be exposed to full public scrutiny. The whole story of the dubious relationship between the Israeli government and British politicians must come out into the open. And Ambassador Regev, who has presided over this infiltration policy, needs to be told that he is no longer welcome. Al Jazeera’s revelations throw new light on Conservative Prime Minister Theresa May’s extraordinary public contradiction last week of US Secretary of State John Kerry speech criticising expansion of Israel’s settlements; extraordinary because Kerry’s position coincides precisely with that of the British government. This reads like UK policy being distorted in the Israeli interest. We also note that Shai Masot accompanied ambassador Regev and Jeremy Newmark, chair of the Jewish Labour Movement, at meetings during the 2016 Labour Party conference. Newmark’s JLM has been instrumental in promoting allegations of rampant antisemitism on the Labour Left, through which supporters of Palestine have been systematically targeted. We urge grassroots members of the Labour Party, trade unions, Momentum and other progressive, antiracist organisations to insist that their leaders dissociate themselves from pro-Israel lobbyists and defend those victimised without due cause. 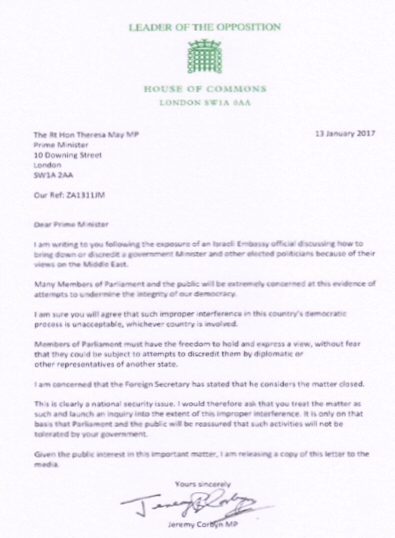 Free Speech on Israel supports the call by Shadow Foreign Secretary Emily Thornberry for a government inquiry into “improper interference in our democratic politics”. Note (updated 10.2.17): Al Jazeera Investigative Unit’s series “The Lobby” can be viewed in four episodes at 10.30 pm on Wednesday January 11, Thursday January 12, Friday January 13 and Saturday January 14. The series will also be available online . These broadcast times are several days earlier than originally scheduled. An undercover Al-Jazeera report has revealed clear evidence of collaboration between both Labour and Tory “Friends of Israel” and the Israeli Embassy in London. The right-wing Daily Mail – a staunch supporter of Israel – has nonetheless reported at length on the revelations, which vindicate Free Speech on Israel’s case over recent months. There can now be no doubt that supporters of Palestine have been systematically targeted in a campaign to undermine their valid criticisms of the Israeli state and its ideology. The UK Foreign Office has said that the Embassy, quoted in the Guardian with all the appearance of trying to play the story down, has apologised and the matter is closed. This is clearly not the case. A full statement from Free Speech on Israel will follow. See the Daily Mail story below. Mr Masot also mocks ‘crazy’Labour leader Jeremy Corbyn and his ‘weirdo’ supporters. Footage shows pro-Israel Labour activists discussing the Jerusalem government’s secret role in backing their activities. FULL MAIL ON SUNDAY STORY HERE.